SDZ insists on attending 5 auto shows overseas and 5 domestically to explore new markets and propagate SDZ brand. Experts from TÜV Rheinland Co., Ltd conducted an annual review of the quality management systems of SDZ Auto Parts Co.,Ltd.. The review was done under ISO/TS16949：2008 requirements. The review covered the making and oversight of SDZ’s operational plan, management examination, data analysis, continued improvement, bidding, purchase control, service/information feedback, study of product-related requirements, supplier management, satisfaction of customers, delivery, production plan, production, handling of customer complaints, preparation for product quality, logo, product protection, approval of PPAP certificate, document control, management of infrastructural facilities, management of equipment, management of measurement devices, laboratory control, management of uniforms, record control, product supervision and measurement, training control, control of substandard products and domestic self-examination. The annual review was completed successfully thanks to the energetic cooperation of all SDZ departments. After the overall and strict examination, experts made positive comments on the implementation of the SDZ quality management systems. Also they put up suggestions on how to progress consistently and expressed the hope that SDZ could continue to follow the principles of constant and gradual improvement, pay more attention to details and provide customers with better products & better service. Over 100 staff worked together for this result and in the future, SDZ plans to learn more about different countries’ local standards (including SDE) to better adopt our products to various markets. We sincerely hope SDZ products could help more international customers benefit! SDZ, as responsible and enthusiastic, is working for fulfill its CSR and dedicating itself to environmental-protecting career. In 2012, SDZ made its “Green Business Plan”. The plan includes developing electrical parts for energy-saving vehicles, improving the product recoverability rate, reducing pollutant discharge amount, lowering of greenhouse gas emissions etc. On developing electrical parts for energy-saving vehicles, SDZ puts the most emphasis. By now, we have developed sensors, which also show our qualified R&D capability. Hope soon we could have more market-oriented electrical products! On improving the product recoverability rate and reducing pollutant discharge amount, SDZ detailed materials flows and make full use of them methodically both in shop and offices. The strategy of SDZ is to take the preemptive opportunities in green industry with little power consumption, better serve to our customers and help to build a better world! 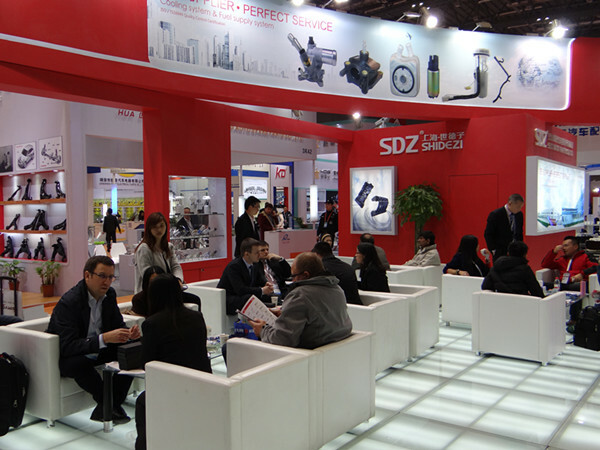 SDZ has attended the 2014 Automechanika Frankfurt during Sep. 16th to 20th in E34, Hall 4.2. 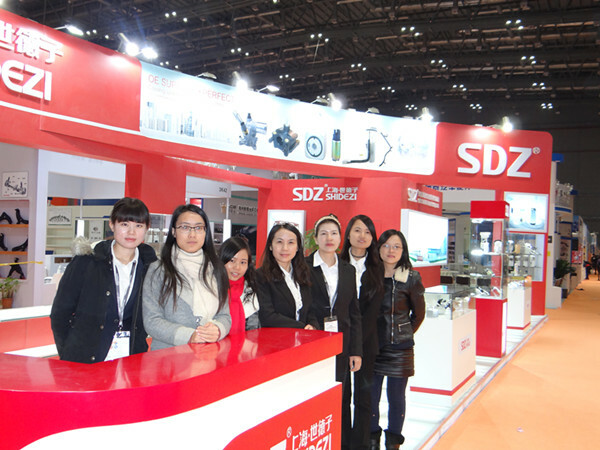 During the fair, SDZ showed its wide range of products, qualified R&D ability and excellent quality. SDZ adopts itself into Europe market and standardize our management into the most advanced and complete supply chain. Our representatives had pleasant conversations with our customers about products and further cooperation. We also participate in other activities to capture auto industry’s leading trends and latest news on the fair. Believe SDZ could progress more and create better future together with you! SDZ has attended the 2014 Automechanika Moscow & MIMS during Aug. 25th to 28th in T339, Hall 7.5. During the fair, SDZ showed its wide range of products especially for LADA, qualified R&D ability and excellent quality. SDZ always values Eastern Europe market. We have developed many models for LADA those years. Believe SDZ could progress more and create better future with you! 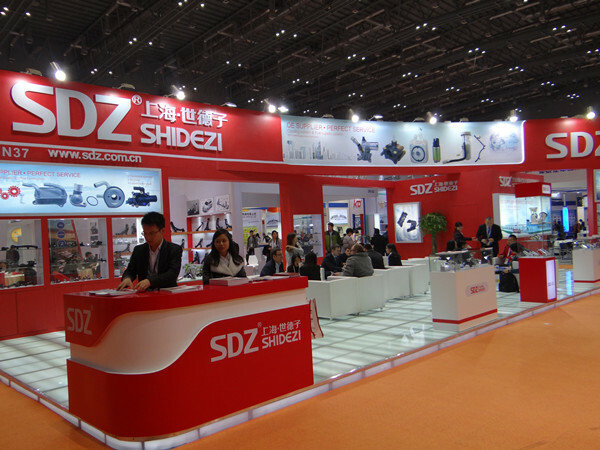 SDZ Auto Parts CO., Ltd attends 2014 Automechanika Shanghai with newest technic and products. Built in 2004, SDZ has grown into one of the largest auto parts autonomous enterprises. Brand “SDZ” is well known in customers and wins approval from them. Automechanika Shanghai 2014, Asia’s largest trade show for automotive parts, accessories, equipment and services, has a record number of exhibitors this week at the Shanghai New International Expo Centre. The total number of exhibitors stands at 4,906, a six percent increase on last year's show, with 39 countries and regions represented. A breakdown of the figures shows an 11 percent increase in international exhibitors to 581, and a five percent increase of Chinese exhibitors to 4,325. “After the 10 years’ endeavor, SDZ’s development and performance are obvious to all. SDZ also steps into a new stage. All staff in SDZ will work harder and bring the best products with perfect service to our customer. ”General Manager Henry concludes. We sincerely hope to create a better future together with you! Automechanika shanghai has ended one week ago! SDZ, as an exhibitor, has achieved great success in the show, not only in terms of maintaining old customers but also attracting new customers ! On the show, SDZ exhibited many very popular products which are new developed in 2015 upon customer’s request. After 10 years’ experience in cooperating with Domestic OE and international well-known brands in Europe & America, SDZ’s processing technic is quite mature which greatly meet the needs of customers worldwide. Every year, SDZ will develop about 100 kinds of new products which are rare in the market and of heavy demand in the future for his customers to assure that his customers can earn more market and compete against their competitors. SDZ will always insist on strict TS16949 Quality Control System and continuously improve his quality and equipments to bring benefit to his customers maximumly! In 2015, SDZ developed many new products upon our customers’ strong request including: Thermostat housing & Thermostat assembly & Oil cooler! These new products are very popular in worldwide market and of heavy demand in future. while, because of many reasons, it is difficult to find a good supplier in China. So, many of SDZ’s old customer ask SDZ to develop it for them so that they can seize this business chance to earn more market and promote their brands! At the same time, SDZ will develop some new products according to the change of market to earn more market in China and abroad. SDZ are willing to develop new products for customers, if the products are of heavy demand, SDZ will develop it for free. Welcome to contact SDZ on new program! 2018 Russia's exhibition is coming ! Russia's exhibition will begin soon, and SDZ will go to Russia to attend the exhibition as promised. Moscow international auto parts, after-sales service and equipment exhibition began in 1991, and is the oldest auto industry exhibition in Russia and even eastern Europe. This year,SDZ will display the stable and best-selling products in the market, there are many new products developed at the request of customers. The potential demand for these new products is very large, and the excellent technology and quality of SDZ also ensure the acceptance of this product in the market. SDZ new products displayed this year are mainly engine cooling system products: oil cooler, thermostat housing and thermostat assembly. Therefore, customers with this demand can take this opportunity to visit our booth. What are the functions and benefits of the thermostat of a car? The thermostat controls the temperature of the engine coolant. when the temperature of the coolant is lower than the operating temperature, the engine coolant flows back to the inlet of the water pump through the bypass. when the temperature of the engine coolant reaches the operating range, the thermostat opens, closes the bypass, and opens the large circulation mode, forcing the engine coolant to flow into the radiator for cooling. Nowadays, more and more large displacement diesel engines begin to use double thermostats, such as xi chai 6dl 2, hi no e13c, Yu chai, Futian Cummins and other engines. the opening temperature of two parallel thermostats for man ( man ) engines is 83 ℃. The Futian Cummins ISG engine is equipped with two adjustable thermostats. the design of the double thermostats increases the flow area of the cooling liquid, and the increase of the flow area reduces the pressure of the circulating cooling liquid. The thermostat opening temperature in the low operating range is 82 - 95 ℃ and the thermostat opening temperature in the high operating range is 88 - 97 ℃. the thermostat temperature is stamped on the top of the thermostat, 82 c indicates the thermostat in the low operating range and 88 c indicates the thermostat in the high operating range. More and more large displacement engines are beginning to be used, and their coolant flow rate is higher. using double thermostats, both thermostats are opened under high temperature, the coolant flow cross-sectional area increases, the water temperature will not rise too fast, thus enhancing the cooling effect. at the same time, the reliability of the two thermostats is higher. if one thermostat is broken, it will affect the engine's work, and the double thermostats are more reliable. In addition, the dual thermostat also has the function of saving energy. for electronic-controlled diesel engines, the water temperature is a very important reference signal for fuel injection. the engine itself has a suitable operating temperature, which is too high and too low. using the dual thermostat can realize more accurate water temperature control, which is helpful to save energy and reduce fuel consumption. In addition, some vehicles can control cylinder heads separately by using double thermostats, for example, the mass four-cylinder engine, etc. because the cooling of the engine itself must ensure that the temperature difference between the inlet and outlet cannot be too large, the double-joint problem can well meet this demand. The thermostat has a calibration temperature, which is usually stamped on top of the thermostat. this temperature refers to the problem that the thermostat starts to open. the thermostat calibration temperature of different engines may not be the same, even the same type of engines may not be the same depending on the thermostat calibration temperature. For a dual thermostat engine, there may be the same thermostat temperature as well as different temperatures, such as the Futian Cummins ISG engine. Therefore, when replacing the thermostat, it is necessary to check the calibration temperature of the thermostat. Inspect the exterior of each thermostat for damage, cracks, embedded debris, seat damage, and other damage. If any damage is found, replace the thermostat. If it is suspected that the thermostat is faulty, the opening temperature of each thermostat should be measured to determine whether each thermostat is working properly. Determine each thermostat to measure the corresponding opening and closing values. When installing, make sure that the thermostat matches the opening correctly, and the separate positioner on each thermostat ensures that the thermostat will not be installed in the wrong position. In addition, some car owners will remove the thermostat, which is a very wrong practice. on the one hand, it will cause the engine to run at low temperature for a long time, causing the engine to wear more and damage prematurely. at the same time, it will also affect the fuel consumption of the engine. As the world's second largest auto parts brand fair after Frankfurt, Germany, Asia's largest exhibition of auto parts, maintenance, testing and diagnostic equipment and automotive supplies. The 2018 Frankfurt (Shanghai) Auto parts Exhibition (automechanika shanghai) will be held again from November 28 to December 1 at the National Convention and Exhibition Center (Shanghai) in the Hongqiao region of Shanghai. This year, under the wise leadership of General Manager Chih Haibo , marketing manager Ms Dang Xueling and vice minister of marketing Mr. Chi Hao . We still got the best position in Pavilion 3, Booth No. 3n43. The location is located on the right side of the main passageway of Pavilion 3, 96 square meters fine decoration, Shanghai Shidezi classic Chinese red, atmospheric design, high-end layout, will lead the Chinese auto parts industry to the top of the world. To learn more about new products and other information, please visit BOOTH NO. 3n43 .